Lemons and springtime go together like pumpkins and autumn. If you're lucky enough to have a lemon tree, then you're probably busy harvesting the luscious fruit these days. For those who don't, you can find beautiful lemons for a good price at the farmers' markets. The Joy of Baking Web site, www.joyofbaking.com/Lemons.html, suggests choosing lemons that are fragrant with brightly colored, oily yellow skin. They should be firm, plump and heavy for their size. Avoid lemons that have blemishes, soft spots, green spots or are hard and wrinkled. 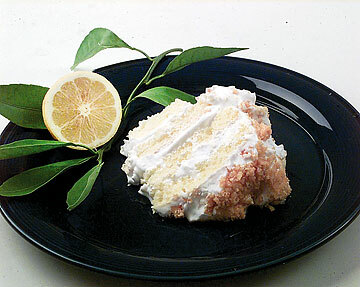 The topping on a Lemon Crunch Cake will add zing to any packaged cake mix. Lemons can be stored at room temperature up to a week or in a plastic bag in the refrigerator for several weeks. One medium-sized lemon will yield about 3 tablespoons juice that may be stored in a covered container in the refrigerator for a few days or frozen in ice cube trays. Thin, smooth-skinned lemons at roomtemperature yield the most juice. To extract the most juice, first roll the lemon on a flat surface, exerting light pressure. This squashes the membranes. If just a few drops are needed, pierce the skin with a toothpick and squeeze out what you need. To store, reinsert the toothpick, put the lemon or lime into a plastic bag, and refrigerate. One medium lemon will also yield about 2 teaspoons lemon peel (sometimes called zest), which contains the fruit's oils and perfumes and gives a recipe intense lemon flavor. Thick, bumpy textured cold lemons are best for zesting. Wash the lemon thoroughly (soap and water is best), as some are sprayed with insecticide and dye. If possible, buy organic lemons when using the outer rind. Remove the zest first before cutting and squeezing a lemon. Be careful not to remove the white pith just under the peel; it's bitter and inedible. Lemon zest is the most aromatic and flavorful when first removed, so use immediately. Cream butter and sugar until light and fluffy. Add eggs and lemon peel; beat well. Sift together flour, baking powder and salt; add to creamed mixture alternately with milk, beating well after each addition. Stir in nuts. Spoon into a well-oiled 9-by-5-inch loaf pan. Bake 55 minutes. Let cool in pan 10 minutes. To make topping: Combine lemon juice and sugar. Spoon over loaf. Remove from pan and let cool. Approximate nutritional analysis, per slice (based on 10 slices): 260 calories, 10 g total fat, 4 g saturated fat, 55 mg cholesterol, 400 mg sodium, 38 g carbohydrate, 1 g fiber, 19 g sugar, 5 g protein. Cook asparagus according to package directions. In a small saucepan, melt butter; stir in sesame seeds and heat on low until seeds are golden, about 5 minutes. Add lemon juice and salt. Drain asparagus spears; arrange on serving dish. Pour butter sauce over asparagus. Serves 6. Approximate nutritional analysis, per serving: 70 calories, 5 g total fat, 2.5 g saturated fat, 10 mg cholesterol, 125 mg sodium, 5 g carbohydrate, 3 g fiber, 2 g sugar, 3 g protein. Mix and bake cake in a tube pan according to package directions; cool. Cut cake into 4 layers. To make topping: Grease a 13-by-9-inch baking pan. Combine sugar, water and syrup in a saucepan. Boil to 300 degrees (hard crack stage). Quickly remove from heat and stir in baking soda. Pour into prepared pan; cool and crush into crumbs. To make frosting: Blend powered sugar and lemon extract into cream; spread half between layers and remainder on top and sides of cake. Sprinkle with crunch topping. Serves 16. Approximate nutritional analysis, per serving: 270 calories, 6 g total fat, 3.5 g saturated fat, 20 mg cholesterol, 500 mg sodium, 52 g carbohydrate, no fiber, 45 g sugar, 3 g protein. For Coffee Crunch Cake: Use chocolate chiffon cake mix in place of lemon chiffon; add 3 teaspoons instant coffee to syrup mixture before cooking; flavor cream with 1 teaspoon instant coffee. Candy keeps well stored in air-tight container.